Public comments are being accepted on both the draft Eastern Lake Ontario Unit Management Plan (UMP) and the Lower Salmon River Restoration and Recreation Enhancement Plan through October 2, 2017. Public meetings will be held Tuesday, August 1, 2017 from 2:00 p.m. to 4:00 p.m. and Thursday, August 3, 2018 from 6:00 p.m. to 8:00 p.m. at the Pulaski Academy Auditorium. The Pulaski Academy is located at 4624 Salina Street, Pulaski, NY 13142. The New York State Department of Environmental Conservation (NYSDEC) has scheduled public hearings on the Mute Swan Revised plan. Dates, times and locations are listed below. These hearings will give the public an opportunity to provide feedback on the revised plan. DEC invites the public to comment about a proposed remedy to address contamination related to the Halletts Point, Buildings 2 and 3 Site (1st Street, Queens), within New York's Brownfield Cleanup Program. Public comments about the proposal will be accepted through October 7, 2017. Click the web link above at "Additional Information" to learn about the proposal and how to comment (English y Espanol). Project documents can be reviewed at: Queens Public Library, Astoria Branch, 14-01 Astoria Boulevard, Long Island City, NY 11102; phone: 718-278-2220 --and-- Queens Community Board 1, 45-01 Ditmars Boulevard, LL Suite 125, Astoria, NY 11105; phone: 718-626-1021. DEC has received a Brownfield Cleanup Program (BCP) application and Draft Remedial Investigation Work Plan for a site known as MJW 47 LLC, site ID #C231106. This site is located in the City of New York, within the County of New York, and is located at 682 9th Avenue. Comments about the application and draft work plan must be submitted no later than October 13, 2017. The application, draft work plan and other relevant documents can be reviewed at: Columbus Library, 742 10th Avenue, New York, NY 10019 --and-- Community Planning Board 4, 330 West 42nd Street, 26th Floor, New York, NY 10036. Hunts Point Parcel D, site ID #C203100. This site is located in the Borough of Bronx, within the County of Bronx, and is located at Food Center Drive (NE Corner). 400 Food Center Drive, site ID #C203101. This site is located in Borough of Bronx, within the County of Bronx, and is located at 400 Food Center Drive. Comments about the applications must be submitted no later than October 13, 2017. The applications and other relevant documents can be reviewed at: Woodstock Library, 761 East 160th St, Bronx, 10456 --and-- Bronx Community Board #2, 1029 East 163rd St –Rm 202, Bronx, 10459. DEC invites the public to comment about a proposed remedy to address contamination related to the 2424 Hamburg Turnpike Site (Lackawanna, Erie Co.), within New York's Brownfield Cleanup Program. Comments about the proposal will be accepted through October 13, 2017. Project documents can be reviewed at: Buffalo & Erie County Public Library, Lackawanna Branch, 560 Ridge Road, Lackawanna, NY 14218; phone: 716-823-0630. Ten-thousand acorns from a single tree? Wow! Come discover how these mighty giants provide food for many of the forest’s inhabitants on Saturday, October 14, 10:30 - 11:30 am. Our knowledge of fungi has mushroom for improvement to say the yeast. Come learn about these mysterious organisms with former intern Marcus Rosten and by the end we’re sure you’ll be lichen them! Registration required; call 716-683-5959 to sign up. Families can enjoy a woods walk and learn new nature play ideas to try at home. Participants will use their Passport to Play to guide them through several outdoor fall adventures. Registration required; call 716-683-5959 to sign up. The autumn foliage is varied and beautiful in New York’s Capital Region. Join fellow “peepers” on Saturday, October 14th at 2:00 pm for a walk through Five Rivers’ fall colors. Meeting Location: Crossings of Colonie, 580 Albany Shaker Road, Loudonville, NY. DEC invites the public to the meeting to learn about a proposal to address contamination related to the Former Damshire Cleaners Site (Albany, Albany Co.), within New York's State Superfund Program. Public comments also will be accepted at the meeting, and during a public comment period that runs through October 27, 2017. Click the web link above at "Additional Information" to learn about the public meeting, the proposal and how to comment. DEC invites the public to the meeting to learn about a proposed remedy to address contamination related to the K-Front Street Holder Station Site (Brooklyn), within New York's Manufactured Gas Plant Program. Public comments about the proposal also are welcome at the meeting, and during a public comment period that runs through November 11. The public is invited to the meeting being conducted by DEC and the New York State Department of Health to provide an update on sampling performed and ongoing investigations in the Towns of Cambridge, Jackson, and White Creek, Washington County. A public availability session will be held immediately after the 6:00 PM public meeting. Click the web link above at "Additional Information" to learn more about the public meeting and the sampling performed. The NYSDEC proposes to issue General Permit GP-0-17-005, Adirondack Park Benthic Mat General Permit for placement and removal of benthic mats in shoreline areas within the Adirondack Park. The New York State Department of Environmental Conservation (NYS DEC) has reviewed the Hazardous Waste Management Facility permit application submitted by FMC (FMC Corporation, 100 Niagara Street, Middleport, NY 14105. 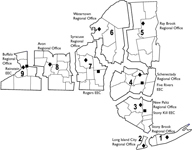 NYSDEC Hazardous Waste Management Facility Permit Application No. 9-2936-00017/02004; EPA ID No. NYD002126845) pertaining to their Middleport Hazardous Waste Management Facility located in the Village of Middleport, Niagara County. The application has been determined to be complete by NYS DEC for purposes of further NYS DEC review and public comment pursuant to 6 NYCRR 621.7. Written comments concerning NYS DEC's SEQRA determination, the permit application, and the conditions and terms of the draft permit may be submitted to the contact listed above. The New York State Department of Environmental Conservation (NYS DEC) Region 7 Office proposes to issue General Permit GP-7-17-001, Shoreline and Stream Disturbance, Freshwater Wetlands (FWW) and Docks. The General Permit (GP) covers a group of common activities pertaining to lakeshore and stream bank stabilization, erosion protection, dredging, demolition, repair and replacement of certain in-water structures, small boat ramps, culverts, dry hydrants, and protection for individual lake front water intake structures. Comments must be submitted to the contact person listed above in writing no later than October 20, 2017 or 15 days after the publication of this notice, whichever is later. DEC has received a Brownfield Cleanup Program (BCP) application for a site known as 45 Mohawk Avenue, site ID #C447050. This site is located in the Hamlet of Alplaus, Town of Glenville, Schenectady County, at 45 Mohawk Avenue and Maritime Drive. Comments about the application must now be submitted no later than October 20, 2017. The application and other relevant documents are available at: Schenectady County Public Library, 99 Clinton Street, Schenectady, NY 12305. The New York State Department of Environmental Conservation (DEC) has received a Brownfield Cleanup Program (BCP) application and Draft Remedial Action Work Plan for a site known as Hunts Point Parcel A-2, site ID #C203094. This site is located in Borough of Bronx, and is located at the NE Corner of the Southern Intersection of Food Center Drive and Halleck Street. Comments regarding this application and work plan must be submitted no later than October 21, 2017. Click link at "Additional Information" above to learn about the site and how to comment. The application, Draft Remedial Action Work Plan and other relevant documents are available at: New York Public Library - Hunts Point Branch, 877 Southern Blvd, Bronx, 10459 --and-- Bronx Community Board #2, 1029 East 163rd St - Rm 202, Bronx, 10459. DEC invites the public to comment about a proposed plan to address contamination related to the Ebenezer Plaza 1 Site (New Lots Ave., Brooklyn), within New York's Brownfield Cleanup Program. Public comments about the proposal will be accepted through October 21, 2017. Click the web link above at "Additional Information" to learn about the proposal and how to comment. Project documents can be reviewed at: Brooklyn Community Board 16, 444 Thomas S. Boyland St. - Room 103, Brooklyn, NY 11212; phone: 718-385-0323 --and-- Brooklyn Public Library, East Flatbush Branch, 9612 Church Ave., Brooklyn, NY 11212; phone: 718-922-0927 --and-- Brooklyn Public Library, Spring Creek Branch, 12143 Flatlands Ave., Brooklyn, NY 11207; phone: 718-257-6571. If you ordered birdseed from the Friends of Five Rivers, your order will be ready on this date. Please plan to pick it up then. If you have any questions, please call the Friends of Five Rivers at 518-475-0295. Also on this date, from 10:00 AM to 2:00 PM, please join us for an open house on bird feeding basics. If you enjoy observing birds, why not bring the birds to you? Join us at Five Rivers’ bird observation area inside the visitor center to learn how to attract birds to your home. We’ll discuss bird feeders, water features, and seed and other food sources. A demonstration of aids for seeing and hearing birds, suggestions for recording observations, and a preview of Project FeederWatch will add to your enjoyment of bird feeding. This is an open house event; come for a few minutes or a few hours! If you enjoy observing birds, why not bring the birds to you? Join us on Saturday, October 21, 10:00 AM to 2:00 PM at the Five Rivers’ bird observation area inside the visitor center to learn how to attract birds to your home. We’ll discuss bird feeders, water features, and seed and other food sources. A demonstration of aids for seeing and hearing birds, suggestions for recording observations, and a preview of Project FeederWatch will add to your enjoyment of bird feeding. This is an open house event; come for a few minutes or a few hours! This event is arranged by the I FISH NY program of the DEC in cooperation with the Hempstead Lake State Park. Attendees will learn fish identification, local aquatic ecology, casting safety and techniques and fishing regulations. Following an educational introduction about fishing on Long Island, I FISH NY will conduct basic fishing instruction, ecology and stewardship of local aquatic habitats, fish identification, regulations and casting safety and techniques. The I FISH NY program of the DEC will provide instruction, rods and bait free of charge.